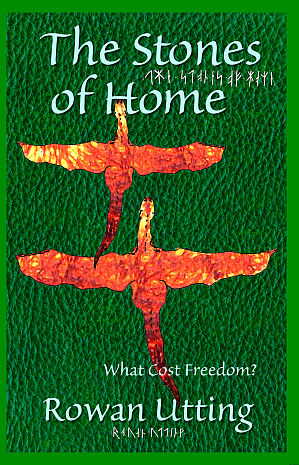 My son, Rowan Utting has published his first novel “The Stones of Home — What Cost Freedom?” The draft manuscript was completed during the first hour of his 16th birthday. It has taken the better part of a year for editing and production. The printed book, downloads and preview will be available worldwide through the family site: www.lambtonpublishing.com/ Free ebooks are available for preview. Rowan Utting was born in 1997, Wellington, New Zealand and had his first music and poem published and performed when only 6. He lives with family in Tawa. Bardic, Rowan Utting’s work is poetic, narrative, mythic, reflective and musical. Along with the language, ‘Alamard’, The Stones of Home has the author’s graphic working notes, embedded songs, music, lexicon and grammar. Not a novel about youth: it explores the lives and emotions of people with magical powers, their place in different societies and the constant war waged by other creatures. After a century and a half of isolation, the surviving Mages of Haven reunite to combat a rising power. Their journey and their fight for freedom leads them through many skirmishes and adventures, to confront an old rivalry between their allies, whom they must unite to defeat their common enemy. The Stones of Home is a bardic tale of magic and dragons, of love and pain, of epic battles and loss, and touches the very heart of what it is to be human.The Stones of Home is epic in scope and set in contemporary Scotland and Ireland. It is literary, humorous, poignant, action packed, tender, philosophical and memorable. 256pp. Suitability: ages 11+. Let your school library know! This entry was posted in resources, Rowna Utting and tagged 16 year old novelist, Alamard, Alamard grammar, Alamard lexicon, Alamard pronunciation, author's graphic notes, debut novel, dragons, Elvish, epic battle, fantasy novel, goblins, Mages, Mages of Haven, magic, new songs, NZ novel, Rowan Utting. The Stones of Home, school library, Tigerwolf, trolls, werewolves, What Cost Freedom?, young adult fiction, young bard, youth literature by revfelicity. Bookmark the permalink. Congratulations! My kind of book (age in an author doesn’t really matter — just story!) Is it available on Kindle / Nook? Yes Ebook is availabe in Kindle KF8 format as well as classic e-Pub.